Rahuls interest in the game was fuelled from a very young age by. Rahul's interest in the game was fuelled from a very young age by his father Sharad. Sharad who had played University cricket when in Indore, had given up the game to concentrate on his career in Kissan, a company that was in the United Breweries stable those days. Sharad gradually formed a club cricket team in Kissan which had players drawn from the UB Group companies. They had their nets at the St. Joseph's Indian High School grounds, right opposite the UB beer distillery. The team figured in KSCA's state fifth division league. Sharad, on the strength of his being the president of the KSCA-affiliated Kissan Cricket Club, received complimentary passes for big matches staged at the KSCA Stadium. He took Rahul to all the Ranji Trophy matches from the time his son was just two years old. "Over the years I took Rahul along with his friends in the locality and later my younger son Vijay. The other children used to lose interest in watching the games and be more excited by the snacks, soft drinks and food. But Rahul was glued to the game. He would want to know the name of each batsman, bowler and fielder and kept asking questions about the game. Slowly I realised that his interest in the game was much higher than that of the other children and I started taking only him to the matches,'' said Sharad. By the late 70s when Rahul could recognise cricketers on his own, he was sold on India's two erstwhile master batsmen Sunil Gavaskar and GR Vishwanath. He used to ask his father to invite them home. Of course Sharad tried, without success. But he managed to get photographs of Gavaskar posing with Rahul and Vijay. This made Rahul a bigger fan of Gavaskar and his school of classical batting. This apart, Sharad, through Rahul's formative years, kept drilling into him that his wicket was never to be gifted away. Another lesson that his father taught him was not to play strokes that would dismiss him. Thus with his then role model Gavaskar playing percentage cricket, his father drilling the same lessons into him at home and his coach Keki Tarapore feeding him more of the same at nets, Rahul was totally sold to the idea of wearing down the opposition. Rahul's parents also laid down parameters for his continuing with the game. They insisted that he could play the game only as long as he did well in studies. A first class was the bare minimum they stressed. "I told him that he should study when not playing. He should not while away the time. Also we kept telling him that whatever task he took up he should complete it. We encouraged him to play cricket but on the condition that his studies would never suffer,' said Sharad. These conditions had an amazing impact on Rahul. Blessed as he was with the ability to compartmentalise tasks, Rahul, like his mother, reveled in multi-tasking. His school friends speak in awe of his ability to study in a crowded bus each morning. There would be only standing room in the bus. Rahul would cling on to the vertical bar in the bus and read his school books unmindful of the din around him. He would get off the bus and straight away head for the nets. In the evening he would repeat this studying performance on the bus. Rahul's ability to stay focused on whatever he had on hand won him great praise from his teachers. It is a trait that he took with success to the cricket ground too. "I remember speaking to Sister Monica of St Anthony's School where Rahul did his primary schooling. Of all the students she recalled his involvement and commitment in everything he did even at that age. The teachers in my school too were all unanimous in giving him permission to play cricket. They all spoke of his focus and dedication. That impressed me, '' said Fr Coelho, his principal at St Joseph's Boys High School. Rahul's success at the Under-15 and Under-17 levels of inter-state cricket brought him quick recognition. At the age of 16, he went on a private cricket tour to England. That tour was sponsored partly by Kingfisher (United Breweries). There were a number of talented youngsters on that tour. Besides, former Test player Roger Binny and state left-arm spinner Prakash Rathod, who were both in England at that time, played a few matches for the team. On that tour, Sujith Somasundar was Rahul's room mate. Sujith bowled a bit of medium pace and was a promising opening batsman. He got to play in quite a few matches and with a fair degree of success. Rahul, however, was yet to establish himself as a frontline batsman. He played in only a few matches and did not do too well. With things not going well for Rahul on that tour, he became more intense and tried all the harder. 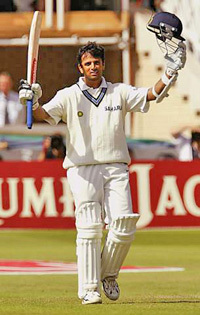 "Rahul used to be in a world of his own in England. We were two of the youngest in that team which had a good mix of youngsters, experienced league players and veterans. Rahul was so obsessed with the game that he would walk about and play imaginary shots all the time. Even when we were on the street or in any place other than a ground, Rahul would be thinking only about batting and play imaginary shots. In the night he would cry in the room as he recalled his being dropped from that day's playing eleven or failing with the bat. He wanted to get maximum out of the tour, but felt he was not getting anything,'' said Sujith. This habit of Rahul's to play imaginary cricketing strokes had become something of a joke among his friends and family members. On one occasion, in Bangalore, he was en route from residence to airport to drop his cousin's father-in-law, S Viswam, a well-known Delhi journalist who had worked with The Statesman and Deccan Herald newspapers. Viswam, on reaching Delhi called up Rahul's father and told him that he had seen `cricket-natyam' being enacted at the airport that day! Apparently, Rahul, while awaiting the departure call for Viswam's flight, was unmindful of the amused looks he was getting from others in the airport and went about playing his imaginary front foot defence, back foot defence, drives, cuts, pulls and sweep shots - movements that Viswam referred to as `cricket-natyam' (a take-off on Bharatanatyam, a well known form of Indian classical dance). By the time Rahul moved to St. Joseph's College of Commerce his obsession with cricket was matched only by his relentless studying habits. In a way he seemed to live a Jekyll and Hyde role. Most of the year, when he played cricket, his friends were the Fazal Khaleels and the Sujit Somasundars, boys who went through the KSCA cricket system with him. But off the field and closer to the annual examinations a different set of students were his companions - students for whom academic excellence was the only thing. Amazingly Rahul juggled with both aspects of his life superbly.